Everyone prefers a fast website. Even a few extra seconds spent loading each page can be a drag on your visitors attention. While there are a lot of factors that determine a website’s loading speed I recently ran a test of different web hosting environments on my own site. The defacto hosting standard for many WordPress sites is a cPanel account on shared web hosting. This setup is ubiquitous and easy to manage. One alternative is a Virtual Private Server (VPS) with SSD storage. The trade off is that a VPS requires more knowledge to setup and manage, but the performance can be a big step up. I ran a test, running this WordPress 4.0 website on reasonable (i.e. not bottom dollar) shared hosting account and a Vultr VPS with 768mb RAM and SSD storage and monitored response times. basic WordPress 4.0 site, without page caching. The VPS was running Apache 2.4 and the shared hosting on Litespeed HTTP. The result was noticeably snappier pages on the VPS. The other take away is the consistency. 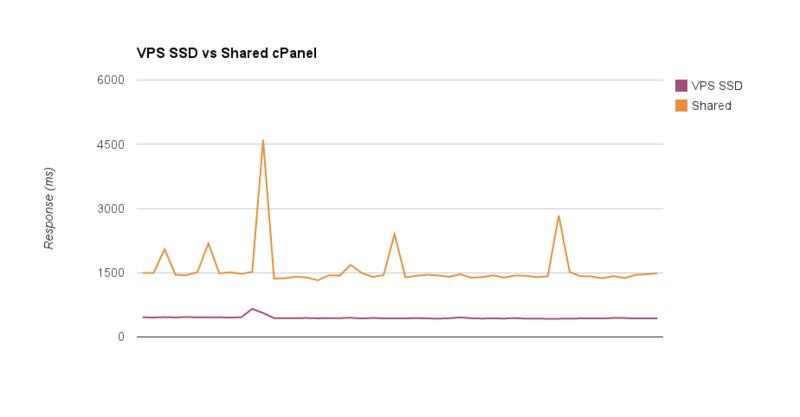 On a shared server your response times can vary depending on what other sites on the server are doing. The VPS which has isolated resources gave far more consistent performance.